Only a portion of the cost of the student’s education is covered by tuition and fees. Because Pepperdine University is a private, independent institution receiving no operating support from public funds, gifts from concerned friends, grants from supporting foundations, and income from endowments provide both operational and capital funds not provided by student charges. The following charges are for the academic year beginning August 2018. The University may adjust these rates at any time before charges are incurred by the student. Charges may be expected to increase on an annual basis as higher education continues to experience cost increases. Full-Time MBA Programs: Includes 10-18 units of tuition per trimester. Per unit rate of $1,775 applies to fewer than 10 units or more than 18 units. Full-Time MBA Program students who are enrolled in 10-18 units and subsequently drop below 10 units will have the new unit load calculated at the rate of $1,775 per unit. Full-Time MS in Applied Finance and MS in Applied Analytics: Includes 10-18 units of tuition per trimester. Per unit rate of $1,870 applies to fewer than 10 units or more than 18 units. Full-Time MS in Applied Finance and MS in Applied Analytics students who are enrolled in 10-18 units and subsequently drop below 10 units will have the new unit load calculated at the rate of $1,870 per unit. Full-Time MS in Global Business: Includes 10-18 units of tuition per trimester. Per unit rate of $1,920 applies to fewer than 10 units or more than 18 units. Full-Time MS in Global Business students who are enrolled in 10-18 units and subsequently drop below 10 units will have the new unit load calculated at the rate of $1,920 per unit. Full-Time MS in Human Resources Program: Includes 10-18 units of tuition per trimester. Per unit rate of $1,805 applies to fewer than 10 units or more than 18 units. Full-Time MSHR Program students who are enrolled in 10-18 units and subsequently drop below 10 units will have the new unit load calculated at the rate of $1,805 per unit. Full-Time MS in Real Estate: Includes 10-18 units of tuition per trimester. Per unit rate of $2,015 applies to fewer than 10 units or more than 18 units. Full-Time MS in Real Estate students who are enrolled in 10-18 units and subsequently drop below 10 units will have the new unit load calculated at the rate of $2,015 per unit. PKE MBA: Includes 8-11 units of tuition per trimester. Per unit rate of $3,945 applies to fewer than 8 units or more than 11 units. Executive MBA: Students who began the program prior to Fall 2017: Includes 7-12 units of tuition per trimester. Per unit rate of $2,700 applies to fewer than 7 units or more than 12 units based on the 50-unit curriculum. Students who began the program in Fall 2017 or after: Includes 7-12 units of tuition per trimester. Per unit rate of $3,000 applies to fewer than 7 units or more than 12 units based on the 45-unit curriculum. MS in Organization Development: Includes 4-10 units of tuition per trimester. Per unit rate of $2,050 applies to fewer than 4 units or more than 10 units. Executive DBA: Includes 5-8 units of tuition per trimester. Per unit rate of $3,000 applies to fewer than 5 units or more than 8 units. Subject to change by referendum; applicable to all Full-Time Programs students. Required with each housing contract entered into by all new and returning students to reserve apartment space; credited to apartment charges upon occupancy. 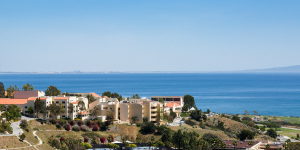 The Drescher Graduate Campus Apartment Complex is located on the Malibu campus. The apartments have four bedrooms and house four students. Liquidated damages pursuant to Cal. Civ. Code §1671-b; charged when the company reimbursement payment deadline is missed. Liquidated damages pursuant to Cal. Civ. Code §1671-b; assessed at .027 percent per day and calculated against all delinquent balances. The imposition of such a finance charge does not constitute an agreement to forebear collection of the delinquent account. Students are responsible for the payment of any outstanding balance on his or her account. All tuition charges are due by the first day after the add/ drop period of the term unless the student is eligible for, and has chosen one of the installment payment options listed in the section titled “Payment Options.” Students who register after the due date are required to pay at the time of registration. Registration is not completed until all charges paid in full or satisfactory payment arrangements are made in accordance with the payment policies described below. The online student account serves as the official student “bill.” Hard copy account statements are not generated. The account will be updated automatically with every charge/credit posted to the student account. Students can view their account information including charges/payment amounts and due dates in WaveNet, on the Student Center. Students are responsible for monitoring their student account online and making the appropriate payment arrangements to meet the payment due date(s). The University will accept the following forms of payment in addition to financial aid and loans: cash or checks drawn from a U.S. bank in U.S. dollars and wire payments (contact the Student Accounts Office for information regarding payment and delivery options). Electronic check (eCheck) payments may be made online through WaveNet by accessing the “Make A Payment” tab located on the Student Center. There is no service fee for an eCheck payment. A fee will be assessed for each returned check. Repeated occurrences of returned checks will necessitate all future payments to be made in cash, cashier’s check or wire transfer. In the event that the student fails to attend class or leaves the University for any reason, the student must formally withdraw through the Program Office. Failure to complete this withdrawal process may result in continued obligation for tuition and other charges. If the student adds a class(es), the additional balance generated by new charges must be paid immediately or in accordance with the University payment policies. The online student account serves as the official student “bill.” The account will be updated automatically with every charge or credit posted to the student account. The student account online reflects the charges, credits, amount due and due dates and can be viewed through WaveNet on the Student Center. Students are responsible for reviewing their student account online and for making appropriate payment arrangements to ensure the payment is received by the Office of Student Accounts by the payment due date. Finance charges will accrue daily on any past due amounts. Credits or payments will apply first to this penalty and then to the principal. Tuition payment or tuition payment arrangements for each trimester should be made prior to the first payment due date. The $2,000 nonrefundable deposit must be submitted within 10 days of the student’s acceptance to guarantee the right to register. This deposit will be credited toward tuition for the first term upon enrollment. Tuition for each trimester is charged at the flat rate indicated under the “Current Charges” section of this catalog. The $1,400 nonrefundable deposit must be submitted within 15 days of the student’s acceptance to guarantee the right to register. This deposit will be credited toward tuition for the first term upon enrollment. Tuition for each trimester is charged at the flat rate indicated under the “Current Charges” section of this catalog. The $5,000 nonrefundable deposit must be submitted within 15 days of the student’s acceptance to guarantee the right to register. This deposit will be credited toward tuition for the first term upon enrollment. Tuition for each trimester is charged at the flat rate indicated under the “Current Charges” section of this catalog. The University offers several payment options for students to pay their tuition, room and board charges. The balance of the student’s account is due in full by the first day after the add/drop period for each trimester. A student may choose a payment option online through his/her WaveNet account by selecting the “Payment Plan” tab on the Student Center page. Students whose accounts have not previously been in default will be permitted to pay the charges (tuition, room/board when applicable) in installments as described in this section. The outstanding charges are calculated after deduction of any financial assistance. Finance charges will be applicable to each installment payment that is not received by the University by the payment due date. Finance charges will accrue daily on all past due amounts. The privilege of using one of the installment payment options may be revoked upon any installment payment becoming delinquent. Students who do not comply with payment policies or whose account has previously been subject to collection are required to pay all charges prior to registration. Tuition, after deduction of any financial assistance, is divided into two equal installments to be paid according to the following schedule. All other charges are due on or before the due date listed on the student’s online account. A nonrefundable service charge per trimester will be added to the student’s account and is due with the first payment. First Installment Due: on the first day after the add/drop period for the term. Second Installment Due: 30 days from the first installment payment due date. Tuition, after deduction of any financial assistance, is divided into three equal installments to be paid according to the following schedule. All other charges are due on or before the due date listed on the student’s online account. A nonrefundable service charge per trimester will be added to the student’s account and is due with the first payment. Third Installment Due: 30 days from the second installment payment due date. To assure the availability of financial aid, the student should contact the Graziadio Business School Financial Aid Office during the admission process, prior to registration. The Financial Aid Office is located at the West Los Angeles Graduate Campus. Applications for financial aid should be submitted well in advance to ensure timely delivery of financial aid funds. This is particularly critical during peak periods when the application processing may take a few weeks. If the student plans to rely on federal or private credit-based loans, the loans must be secured prior to the term start date. A pending financial aid application does not justify deferral of payment. Regardless of the loan status, the student is ultimately responsible for payment of all charges incurred. The student should make arrangements each trimester to ensure that all charges are paid in full. Additional information concerning financial aid may be found in the “Financial Aid ” section of this catalog or online. University operating expenses and student charges are planned on an annual basis. The refund policies have been established in recognition of both the University’s advance commitment to operating expenses and a spirit of fairness for students who find it necessary to discontinue the use of University services. The policies for dismissal and suspension are the same as for voluntary withdrawal. Consideration for refund of tuition due to the student’s intention to drop a course or withdraw from the University requires written notice from the student to the Office of Student Information and Services (Registrar’s Office) or the Program Office. The effective date for determining the refund amount according to the schedule below is the date the student submits official written notification of withdrawal to the Office of Student Information and Services or the Program Office. Students may drop classes without tuition penalty during the add/drop period only. However, a charge of $150 withdrawal fee is assessed if all classes are dropped during the add/drop period. Students withdrawing from courses after the add/drop period are subject to the partial refund policies listed below. Specific dates are contained in the registration materials for each term. Because the format of courses in some of the programs offered by the school varies considerably from the schedule published, a separate refund schedule has been established. Students in these programs should refer to their orientation materials for this information. This refund schedule will be applied to the maximum number of units in which a student was enrolled if the student withdraws or is dismissed at any time during the trimester. Tuition for classes not meeting on a regular trimester schedule will be refunded in the same proportion as the class time is to the total class time for a regular trimester. *A week is a calendar week in which any Graziadio School class is scheduled. Full-time programs students who are enrolled in 10-18 units and subsequently drop below 10 units will have the new unit load calculated based on their program per-unit rate. The difference between this new amount and the original flat rate will be refunded in accordance with the percentage refund schedule. Students who drop units within the flat rate range (10-18) are not eligible for a refund. The prepaid first trimester Full-Time MS Program tuition is non refundable after the July 1 deadline and is not subject to the standard refund calculation policies described in the “Refund Policies” section of this catalog. Most fees are nonrefundable; however, if a student drops a course that includes a workshop, the student will not be charged the workshop fee unless the workshop was attended. Withdrawal from all classes or failure to complete all registered courses during a trimester may result in loss of eligibility for the full amount of disbursed federal funds. The withdrawal date is the date the student officially notifies the respective Program Office regarding his/her withdrawal from the trimester or from the University. All unearned financial aid funds will be returned and might result in unpaid school charges. Only students who complete more than sixty (60) percent of the term will maintain eligibility for disbursed federal funds. The Graziadio Business School returns unearned federal Title IV funds (Federal Direct Loan Program, Federal Pell Grant Program, and Federal Supplemental Educational Opportunity Grant Program) as stated in Federal Regulations, 34 CFR parts 668.22(i), 682, and 685. Federal funds are returned in the following order: Federal Direct Unsubsidized Stafford, Federal Direct Subsidized Stafford, Federal Direct PLUS and Graduate PLUS loans, Federal Pell Grant, and Federal Supplemental Educational Opportunity Grant. Additional information regarding return of financial aid funds may be obtained from the Financial Aid Office. Credit balances resulting only from financial aid are processed automatically after the add/drop period. Refunds can be issued via direct deposit to a bank account determined by the student. Students are strongly encouraged to sign up eRefund (direct deposit) online on the Student Center page with their bank information. Students who do not sign up for eRefund (direct deposit) are issued a check that is mailed to the student’s local address. 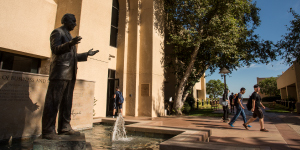 Refunds of credit balances generated by funds other than financial aid require written requests mailed to the Student Accounts Office or emailed from the Pepperdine email account. Refund of credit balances are not be made until funds have cleared the bank and are showing on the student’s account; this includes credits from loan funds, checks, and dropped courses. Refund of a credit balance that includes a payment by check has a 10-business day waiting period before the funds may be returned. Students should consult with the Financial Aid Office, the Program Office and Registrar’s Office regarding the impact of withdrawal/ change in course load on financial aid or veterans’ benefits. All charges owed must be paid at the time of withdrawal or dismissal. Students receiving financial assistance may be required to return a portion of financial aid proceeds as determined by the date of withdrawal or change in course load. Payments in excess of the amounts due to the University may be rejected and returned to the payer. Students are responsible for accurate and timely payments. Payments made in addition to financial aid that covers all tuition charges will result in an overpayment and will be subject to the overpayment refund policy. Any overpayment amounts accepted by the University may be refunded at the end of the term with the student’s written request. A $50 processing fee will be deducted from the amount of the refund. A student may not receive any diploma, certificate, or transcript until all accounts have been settled in accordance with University policies described above. Such documents will be retained by Pepperdine University as security for such obligations until they are satisfied. If a student defaults on payment of the Pepperdine student loan and/or student account balance, all records will be held until the student either brings the loan to current status or pays off the account balance. Every student with a loan must complete an exit interview with the Financial Aid Office before any records will be released. Each student also agrees to pay all costs of collection upon default, including, but not limited to, collection agency fees, attorney fees, and location searches.